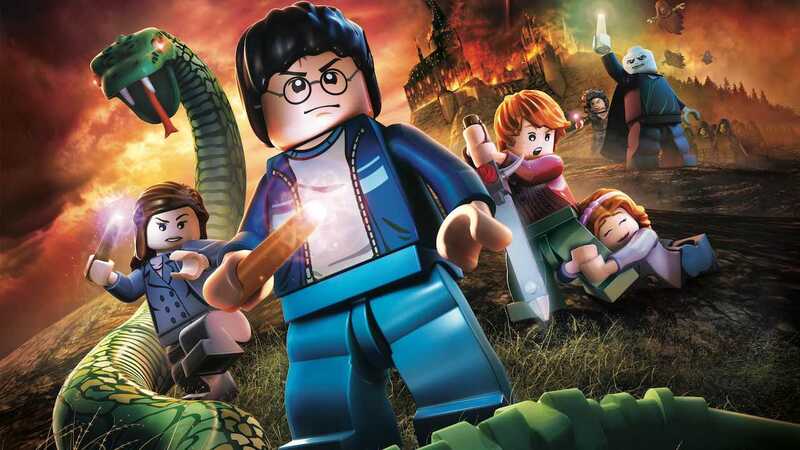 TT Games attempt to sprinkle their own magical formula upon the darker portion of J.K. Rowling’s globally renowned Harry Potter novels, as they transition the last three books, or four blockbuster film adaptations, into the realms of video games through the way they best know how – LEGO! 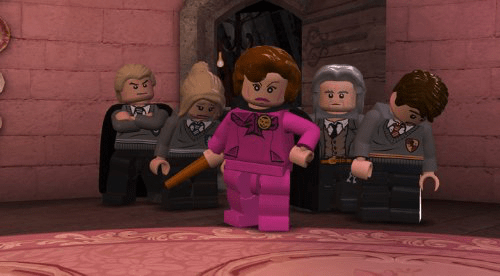 LEGO Harry Potter Years 5-7 follows on from the enormously successful Years 1-4, sharing similar concepts, environments and core design yet serving to expand upon them to ensure the series remains fresh with a few new ideas. As is the norm, you can expect the narrative to be presented through facial expression and the occasional audible coo or grunt rather than any dialogue, with plenty of humorous parody making light of Harry’s more harrowing years. Those familiar with the source material will, therefore, be able to piece together what’s going on, although, even if you aren’t a die-hard Harry Potter aficionado, it won’t be necessarily detrimental to your gameplay experience. Hogwarts School of Witchcraft and Wizardry acts as your hub for the initial portion of the game before Harry, Hermione and Ron abandon its confines to set out to search for, and destroy, Voldemort’s series of Horcruxes. Nearly Headless Nick returns to act as a guide between level locations to ensure that the player doesn’t get lost, yet there is a greater degree of continuity between levels, at times bridged by further plot points to save such excessive traversal of Hogwarts’ vast corridors. You can look forward to playing out key events from across each of the books, such as gliding across London on a broomstick, fleeing in Hagrid’s motorbike alongside a series of Harry clones as you escape to the Weasley’s, and the inevitable showdown with Voldemort himself. Spells remain integral to the entire game, with a number from Years 1-4 returning coupled with a few additions. Wingardium Leviosa is the most essential, enabling you to lift, move, interact and construct objects, with Expecto Patronum, Expelliarmus and Lumos as further examples of those that return. New spells include Aquamenti, which allows you to cast a plume of water that may be targeted with the Wii Remote to fill objects to weigh them or water plants for instance, and Diffindo, that provides you with the ability to cut shapes out of designated red walls to then be pieced together to form objects. You’re also free to utilise items such as the Invisibility Cloak and pets who may navigate their way through pipework. Later in the game, namely Harry Potter and the Deathly Hallows Part One, you’ll also be introduced to further abilities for Ron and Hermione encompassing the Deluminator, which captures light, and a Bag of Holding that Hermione stores many items within. Players are able to switch freely between such spells and skills by holding the C Button to conjure up a radial wheel, from which your chosen spell may be selected to suit circumstance. You’ll also partake in wizarding duels, initially in training with fellow students but later against Death Eaters and key enemy characters during the plot. These see you stand to oppose each other within a circle, where you must then observe the colour of your opponent’s side to then choose the corresponding spell to counter them in a deadlock. A quick hammering of A or B will then allow you to gain the upper hand, resulting in your enemy losing a piece of health. These are interesting instances, and whilst repetitive will surely be enjoyable for young players. 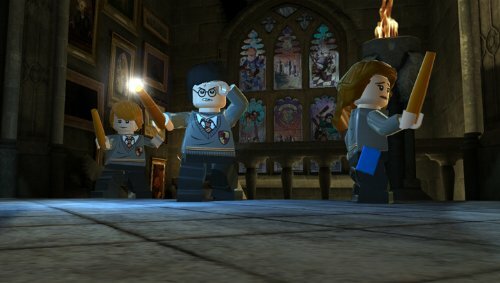 Elongating the game is a wealth of collectables that include the familiar LEGO Studs, Character Tokens, Red Bricks and Gold Bricks, as well as Hogwarts House Crests and Students in Peril which are unique to the LEGO Harry Potter titles. Whilst their inclusion is now expected of the LEGO series, the extensive abundance of such collectables has now become more of a chore than a riveting challenge. Made worse by the fact that players must unlock a Dark Arts character, an effort in itself, to be able to gather the collectables that you actually want to get. Couple this with the necessity of multiple playthroughs to do so and it remains a most tired facet of the LEGO formula, although there are those that inevitably enjoy doing so. Enabling the experience to become all the more authentic is the inclusion of John Williams’ sweeping orchestral score alongside those by composers that wrote additional music for the later films. This aids the whole design in exuberating the charm and character of Rowling’s treasured creation from start to finish. 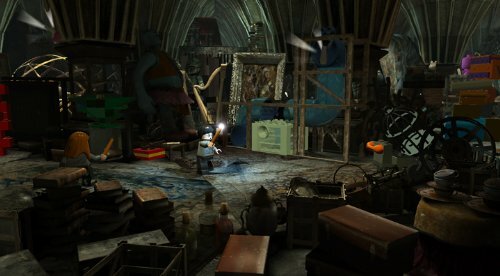 In a year that has already seen the release of LEGO Pirates of the Caribbean and LEGO Star Wars III: The Clone Wars, it remains to be seen as to whether there will ever be a source of inspiration as Harry Potter that provides such a breadth of scope for TT Games’ immensely popular LEGO formula. Brimming with character, entirely faithful to the source material and an entirely magical experience in itself, Harry Potter fans most certainly won’t want to miss out.